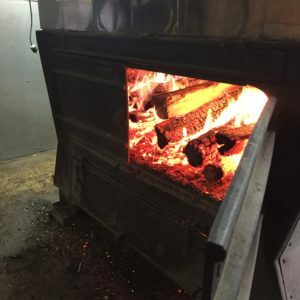 Since our last post we have finished tapping our trees and started boiling! We counted a little over 2,700 taps. We have been chasing vacuum leaks in the woods as much as possible while collecting sap. We got the evaporator all cleaned up and ready for the first boil of the 2018 season. 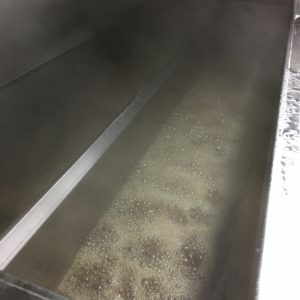 to start the season off with, Richard estimates we made around 100 gallons of maple syrup. It was an exciting sight from the road- the steam billowing out from the stacks with the smell of fresh maple syrup boiling over a wood fire! Spring is here! It has been a fun week. We have had a bunch of visitors from the Big Apple, they are on February break from school. Thanks for visiting us! Don’t forget we always love giving tours! Come visit us and you might even catch us boiling! Glad the season start started off so good! Keep it up! Thank you! We are keeping busy! We have boiled almost everyday since the first boil.